The LCT-01 has been discontinued. There is no available direct alternative available at this time; please contact Omega Engineering regarding other test equipment. The LCT-01 is a portable device designed to help analyze the condition of strain gage-based load cells in scale and industrial applications. 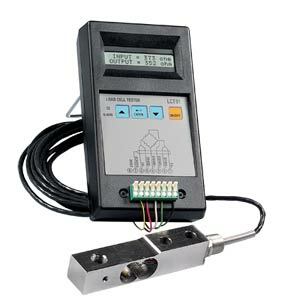 The LCT-01 works with most common types and ranges of load cells found in industry today. The unit is fully computerized, and a 16x2 alphanumeric display guides the operator through all test stages and clearly displays the results. It is also equipped with an LED and buzzer to alert the operator of suspect results.The unit’s three operating keys and concise messages guide the user in a step by step process through the testing, so it only takes a few minutes to learn how to operate the LCT-01. The LCT-01 provides the user with the essential data needed about the condition of the tested load cell, such as physical condition (distortions possibly caused by overloading or shock loads or metal fatigue) and the electrical conditions such as bridge resistance and possible ground faults.